Architect: James Renwick Jr. & William Rodrigue. 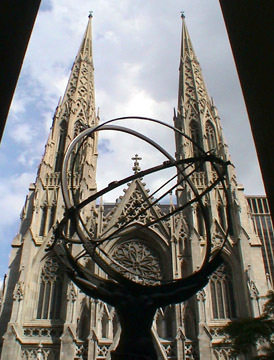 The city's most beautiful church, modeled in a melange of Gothic revival styles but more reminiscent of the single tower cathedral at Salisbury, England, depicted several times in paintings by John Constable, including one at the Frick Collection in New York, St. Pat's transcends its sectarianism and is the ceremonial heart of the city. Its prominence is due in part to its location and architecture, but also to the disproportionate role Catholics play in the city's politics and the police department. When construction started, the Irish comprised abut a quarter of the Manhattan's population. The first St. Patrick's was built in 1815 at 260-4 Mulberry Street between Prince and East Houston Streets. Designed by Joseph Magnin as the city's first major Gothic Revival building, it had cast-iron columns supporting a timber roof and burned down in 1868 and was rebuilt but downgraded to a parish church after completion of the new cathedral uptown on a site that had been purchased by the church as a burial ground. 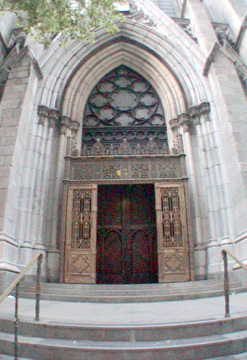 It must have been very foggy and overcast when Goldberger was looking as, in fact, St. Patrick's exterior resonates with rhythmic energy and is a soaring, symmetrical composition of considerable beauty and grace that dominated the midtown skyline when it was built and is Fifth Avenue's most beautiful building. When construction started, the area was relatively open and during construction it fronted on several important mansions across the avenue and the church ran an orphanage across from it on 51st Street that was later razed and replaced by the Union Club. The club subsequently moved uptown to Park Avenue and was replaced by Best & Co., a department store that was torn down by Aristotle Onassis and Arlen Realty for Olympic Tower, the bronze-colored glass, mixed-use skyscraper that now obscures many views from the north of the cathedral's spires. Fortunately, Rockefeller Center's International Building, directly across the avenue, has a large recessed plaza, with Lee Lawrie's great sculpture of Atlas, shown at the left, that affords pedestrians a wonderful frontal view of the cathedral and also gives the great church some more "space." 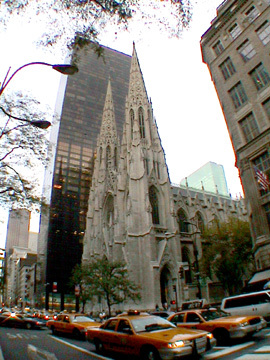 With the development of the New York Helmsley Palace Hotel (now just the New York Palace Hotel) over the landmark Vuillard Houses directly behind the church across Madison Avenue and the Swiss Bank/Saks Fifth Avenue midtown Tower on its south side, the church is, indeed, hemmed in. As it is set back on its own raised terrace and gardens, however, the impact of the surrounding towers is not quite as disastrous as it might seem, although ideally its wonderful spires should have more breathing space. The interior, shown below, is almost as handsome as the exterior despite the fact that it contains no significant art works. A soaring, majestic Gothic space of noble proportions, it may well be the epitome if not epiphany of lobbies in the city. When it was erected, St. Patrick's was the largest cathedral in the United States and the eleventh largest in the world. It's considerably smaller than the later St. John The Divine Episcopal Cathedral on the Upper West Side, but that great nave is fairly dark in comparison. The twin Fifth Avenue St. Patrick's spires, which have foliated tracery in the English Decorated style, reach 330 feet high, which is 24 more than its length. Renwick originally planned for a 400-foot-high tower over the Lady's Chapel at the cathedral's rear, but his plans, fortunately, were not carried out although certainly traditional in plan. He did design the Archbishop's residence on the northwest corner of Madison Avenue and 50th Street and the Parish House on the southwest corner of Madison Avenue and 51st Street, both on the same block. The existing Lady's Chapel was designed by Charles T. Mathews and added in 1908. The church is truly majestic and unquestionably the most important building architecturally on the avenue even if it was not innovative, or even stylistically influential. It simply is very beautiful, not in all details but as a whole. While it has been enclosed by tall buildings, its soaring spires still inspire.